1X. Shen and S. He are with the Centre for Optical and Electromagnetic Research, Zhejiang University, Hangzhou 310058, Zhejiang, China. 2S. He and J. Chen (e-mail: jiajiac@kth.se) are with KTH Royal Institute of Technology, Kista 16443, Sweden. Passive optical interconnects (POIs) have recently been considered as a promising solution to offer high bandwidth and low power consumption for data center networks. 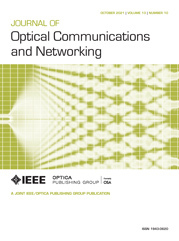 This paper proposes a medium access control protocol for a POI based on arrayed waveguide gratings (AWGs) to facilitate efficient collision-free communications. In order to efficiently accommodate bursty traffic generated by the servers in the data center, we develop a tailored dynamic bandwidth allocation (DBA) algorithm, which is able to schedule resources in both time and spectrum. In the simulation, not only the impact of DBA algorithm parameters but also the system configurations, such as wavelength tuning time, line rate, and the size of the interconnect, have been investigated. For a typical link utilization on an optical interconnect at the top of the rack, the proposed resource allocation scheme ensures both low latency (<0.1 ms) and a low frame drop ratio (almost zero). START Reception wavelength of the master server, timestamp at which START starts to transmit, interval time to send two consecutive REPORT1 messages, and the order to send REPORT1 messages. REPORT1 Reception wavelength of the sender, and timestamp at which the REPORT1 starts to transmit. REPORT2 Reception wavelength of the sender, timestamp at which the REPORT2 starts to transmit, and results of ranging. TABLE MAC address and reception wavelength of all the active servers/interface, results of ranging, and start time to send REQUEST message in the first scheduling cycle of data transfer phase. REQUEST Reception wavelengths of destinations and amount of data that need to be sent to the corresponding destinations. GRANT Start time to send REQUEST message in the coming scheduling cycle, start time and duration of the time slots assigned for sending data to different destinations. tPD_MAX Maximum propagation delay between any two servers or between one server and the interface. tTT Tuning time of the WTT. tTDS/tTDR1/tTDR2 Transmission time to send START/REPORT1/REPORT2 message. tstampS(i) Timestamp carried by the START message sent to Server i.
tg Guard time between two consecutive frames sent to the same destination but from the different senders.